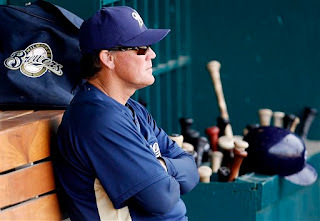 Brewers Beat Padres, Make Cuts ~ The Bucky Channel - The World of Sports from Wisconsin's Perspective. It was a Prince Fielder home run that was the highlight of last night's 6-2 win over the Padres Friday night. The Brewers collected 11 hits, including two from Bill Hall, one of which was a triple. Mike Cameron and Craig Counsell had two hits as well. The Brewers also got good work out of their pitching staff, including from Claudio Vargas who went five innings and gave up one run. Mitch Stetter, David Riske, and Guillermo Mota pitched well also. Capuano being traded has been a rumor since the end of last season, but at this point, he's just not the pitcher he used to be and the Brewers don't have any room for him. Speaking of not having any room, the Brewers are beginning to make cuts, although none of them have been surprising. Friday, the Crew sent righty Tim Dillard to Nashville and catcher Andy Bouchie outfielder Matt LaPorta to Minor League camp. Saturday, the team announced pitchers Zach Jackson and Luis Pena and utility guys Hernan Iribarren and Brad Nelson were heading back to Triple A as well. The Brewers play today at 3:05 against the Kansas City Royals.